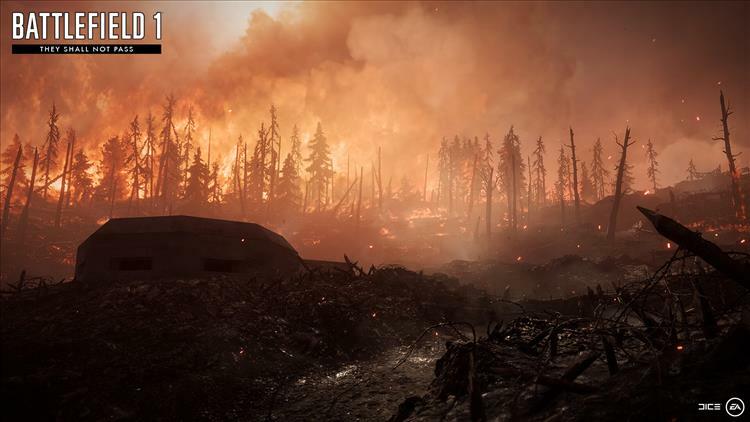 Verdun Heights- It looks to launch players in an uphill fortress siege while a forest fire rages around them. Fort de Vaux- A tight-cornered, indoor shooting gallery ripe for chaotic destruction. Soissons- A mix of urban and rural warfare where according to Battlefield 1's official website, "planes, tanks, and infantry clash in the beautiful French countryside in the early hours of a hot summer day." Rupture- Takes place near Fontenoy and the Aisne river, a setting of poppies growing right beside the trenches. They Shall Not Pass is slated for release in March 2017.